I sort of want to send out Christmas cards, especially since after painting the picture on the left part of the screen last year, we all got sick for the whole month of December and I never got cards made let alone sent out. On the other hand, cards seem like a lot of effort. I'm not sure I have it in me. You've got to weigh the pros and cons. Are you doing it for the right reason. Sometimes NOT doing something is "such" a relief! Hey, you can save 'em for next year, if you want! New baby, everyone understands!!! I mentioned below that most of our ornaments are relatively unbreakable. Other than that some also belong to certain collections of ornaments. By which I don't mean Hallmark collections. We have a moose and caribou collection -- with some other woodland creatures thrown in for good measure. I seem to have picked up a lot of snowflakes and stars along the way and my husband has several airplanes. Some of the ornaments are just pretty, but have no special significance other than the memories of a trip to Target. Others I love hanging up because of some association. There is the moose we got at Glacier National Park and the Buffalo from Yellowstone. The bell I won at a church Christmas party in Fairbanks. The two leather moose from Fairbanks, which we don't quite remember how we got two of. Some old fashioned Santas that my husband's grandmother gave us right after we got married are hanging up and well loved by the kids. Two special ornaments are my son's, given to him by a sweet old lady who died last January, but whom my son always took the time to say hello to and brighten her day. And then there is the B-2 bomber ornament I found for my husband knowing he'd enjoy it, that a friend later teased us about saying, "Nothing says peace and goodwill towards men like heavy artillery and bombs." What's on your tree and what do you think about as you hang things up? My parents downgraded to a halfsize tree and gave us all but the smallest of their ornaments, so most of what's on our tree are the same mish-mash that I grew up with. Even though many are old enough that I don't remember where they came from, they carry many memories of childhood Christmases. I'd say over half of them are a true red, so although they're made of all sorts of materials and come in a wide variety of shapes, they do go together pretty well. What a great post and what a great question. I love that moment when I open the ornament box after the tree is up and the lights strung. There is such a sense of joy as I rediscover my favorite ornaments along with the memories associated with each. I've noticed that my son Ron has the same reaction. When I first put up a tree, I bought a white porcelan angel and loved it so much I decided I would decorate my tree them. I never did make the big investment but I have about five beautiful delicate angels. I have several antique flocked glass ornaments given to me by an elderly friend. We have several "Nutcracker" ornaments purchased at the ballet by my sons. They were six years old the first time I took them to the Nutcracker. The orchestra put them on the edge of their seats as they never imagined such music and the dancing left them agape. We teach second grade Sunday School so we have a collection of ornaments given to us over the years by our students. And of course the homemade ornaments that the boys brought home all through grade school. Yes it is a mishmash and I'm sometimes envious of the beautiful themed trees but not for long. I decorate my tree with love. Tomorrow will be a big day around here. The baby will be one month old and her big brother will turn five. I'm entirely certain that I'm not old enough to have a five year old and that he was born a few weeks ago. Where does the time go? Happy Birthday to them both! And if you ever find out where the time goes, let me know. Happy Birthday GT! Can't believe it's been FIVE years. I hope everyone had a lovely Thanksgiving. We did. All the food was delicious and with my obsessive planning and advance preparation, getting food ready and on the table wasn't crazy. We did forget to make gravy, but since the turkey was moist and the mashed potatoes had plenty of flavor thanks to the chives, garlic and cream cheese, gravy wasn't really necessary. My main complaint was that we wound up with very few leftovers. At least, very little leftover turkey and my in-laws when snacking only ate the turkey, none of the leftover side dishes. We wound up making one meal out of dressing, spinach gratin and sweet potato casserole a few days later. The Boy insisted that the tree go up as soon as the last crumb of pumpkin pie was eaten. We have a new tree this year. My mother is the queen of bargain finding and happened across a pre-lit 9-foot tree last Christmas Eve for $20 at Lowes. My parents don't celebrate Christmas, so she got it for us. We have 11 1/2 foot ceilings in the main rooms of the house, so it isn't too tall and by luck it also happens to be a very slim tree which works out well since we have more headroom than floor space. We didn't get it decorated until Friday, much to the Boy's dismay and we haven't gotten around to putting any lights outside. We usually hang some garland with lights on the porch rails, but haven't decided if we have the energy this year. The year The Boy turned one, I decided that almost all of our ornaments would forever after be metal or wood and generally unbreakable. As I watch my children re-arrange them for the millionth time and scatter more on the floor than there are on the tree, I'm glad. We do have a few special ones up high that they can't reach -- at the top of this tree they are higher than I can reach. That's a good idea on the ornaments. We have not had a breakage problem, but we have only had to watch after one youngster. We may go for a scaled-down tree this year, but still plenty of decorating around the house. The Scrooge (that's me) might even put some outdoor lights up this year - gasp! One of my favorite teas is out for its seasonal run. I just ordered myself some. Yummy. Now, this sounds like the yummiest tea ever! I am going to order me some too! I love the taste of juniper berries... Hubby makes great sourkraut with them. Oh what a find! Thanks for sharing! I just got mine today and made the tea... I love it! I'm sure he loves the other one, too. It's just easier to show it with Beatrix. It looks like Beatrix (B, Bea, Trixie - are there any APPROVED shortened appellations?) might have been in full coo when this picture was taken. Happy babies are the best sound in the whole wide world. Terry, thank you. They have their moments. A very special and delightful photo that really cheered my day. Thanks for sharing that. Nathan has an interesting piece on the word "choice" and how differently he believes liberals and conservatives understand it. That's why I started blogging: to stimulate thought and promote discussion. You don't imply any disagreement, but if you think I'm a little off (or a lot off), or if any of your readers do, stop by and let me know. We'll all learn something. What a beautiful picture of joy and innocence. Happy Thanksgiving. Innocence my foot - did you see the gleam in that child's eye? Good luck with all your cooking Jordana. I wish we were having that many people - it seems a shame for all this work to go into feeding 5 people - but we will have a wonderful meal and be grateful for all our blessings! I do believe those two little girls are smitten with one another, don't you? Hey, you seem to be feeling downright dandy now. Don't overdo, girl. You hear? It's Thumbelina! I knew if I waited long enough! Miss Lisa, "my foot" is right. I thought the same thing, but couldn't get the right phrase. Wow! That's disgusting ;] I've been in my jeans for a while, but they used to be a tad big on me, and now they aren't. Oh well! And sitting down?? I'm impressed. Terry always thinks I prove my insanity by photoshopping his picture, for instance like this. However, the real proof of my insanity lies in the fact that three and a half weeks after having a baby, my husband and I are hosting Thanksgiving dinner for around 10 people. I was thinking I was crazy yesterday while I was running out to the store to buy some gluten-free flour, because my husband's aunt has an allergy. I was thinking this as I was looking up diabetic pie recipes for my husband's grandmother as well. I am willing to make a few special things for those with health related diets. I am not however changing the menu entirely for those on Atkins or similar diets (and none who are attending our feast are on that kind of diet for health reasons). I believe hosting dinner will be doable though. We're keeping the menu relatively simple and there will be almost nothing that can't be made a day or two or three ahead. We'll be having turkey, cornbread dressing, mashed potatoes, spinach gratin, cranberry sauce, pumpkin pie, diabetic pecan pie and apple-cranberry cobbler. I've made the cranberry sauce and assembled the cobbler. I think I may bake the cornbread and biscuits this afternoon, since they are supposed to be a bit stale for the dressing anyway. The gratin and the pie will either get made today or tomorrow, today I hope since tomorrow night we have Bible study and the evening gets kind of hectic. On Thursday we'll just have to make mashed potatoes and turkey and heat the rest up. Sounds simple enough. We actually enjoy hosting these big meals. I just put her on the bathmat for a minute or two while I take the world's fastest shower -- or wait until Justin gets home. Wow! You ARE insane. I'm making a turkey (my first, no doubt), but we are taking it somewhere else. Which is a good thing, since our house is not presentable at the moment. And my baby is 6 months old, not 3 weeks! Good luck on the dinner. I like hosting too, but my wife can get stressed about it, a perfectionist not wanting anyone to see any possible household flaws. If folks can not enjoy the time together, then that's their loss. Maybe your next picture you post can show the before and after jeans side-by-side. I saw the ones posted above of the kids and they're all adorable. Make sure your guests don't "eat" them all up! I see now that your ceaseless mocking of me nothing but a tiny annex in your world of INSANE BUSY-NESS! I hope everyone has a good time and enjoys all that wonderful food and spending time with such a wonderful family. 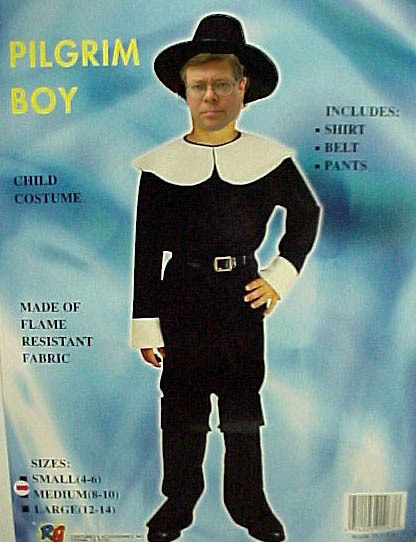 Happy Thanksgiving to all of you Adamses. No Atkins stuff—well then I guess I can’t come. BTW I’m not on it for a health reason—it’s a building safety reason. If o got any heavier I would fall through the floor. Yes you are crazy-- enjoy your family. However, since Thanksgiving is next week, I thought I would share the best pumpkin pie recipe. It is a recipe we worked out, taking bits and pieces from a several different sources. I believe the recipe is mostly from Cooking Light and a cookbook called Cooking from Quilt Country : Hearty Recipes from Amish and Mennonite Kitchens. Preheat oven to 450°. In a small bowl, cream together the butter and brown sugar. Blend in pecans. Press firmly into the bottom of the unbaked pie shell. Bake for 10 minutes, watching carefully so crusts do not puff up or slip down. Prick puffs with the fork if you see this happening, and pat the slipping crusts back up into place with the back of a fork. Let cool before filling. Combine evaporated milk and the next 9 ingredients (milk through pumpkin) in a large bowl. Stir well with a whisk; set aside. Combine cheese and 1 tablespoon syrup in a small bowl. Stir with a whisk until smooth. Pour pumpkin mixture into crust. Drop cream cheese mixture by small spoonfuls onto filling; swirl with a knife. Bake at 350° for 55 minutes or until a knife inserted in the center comes out clean; cool completely on a wire rack. Best if aged overnight. AIGH!!! Too many ingredients! Must settle for Mrs. Smith's! Then again, she (Mrs. Smith) might not put bourbon in hers! hee hee! Dearie, your in the South. It's Y'all. Oh my! I think I need to make this!! Thanks! In honor of Jim Smith's upcoming birthday, we have birthday questions this week. My birthday is at a decent time of year -- mid-April. The daffodils are blooming (sorry LittleA, but I love them) and the world is getting bright and pretty. The problem with my birthday though, especially a problem for my parents the year I was born, is that it falls the day after taxes are due. No doubt they had to file for an extention that year -- and every year thereafter they felt extra impoverished by the time my birthday arrived. 2. How did you spend your 21st birthday? I was in grad school in Delaware. A lady in one of my seminars brought me a huge bunch of daffodils from her garden. I went out with my roommate and a friend from the apartment down the hall to the famous Deer Park Tavern, where Edgar Allen Poe once visited. Then I came home and talked to my boyfriend Justin on the phone. I think that's about it. Lots of people actually. In my senior year of college there were three of us all in the same sorority and all living on the same floor of the same dorm. There was a fellow at church in Alaska and one of our preachers down here in Nashville who also share the date. Plus there are all of these people -- a few of whom are actually noteworthy. Wow! You hit the jackpot on singer/musicians. You list is bad but not as bad as mine. Is He the Child of a Lawyer and an English Major? "You have these options. You can get this book or this one or this one. Not that one! That's not one of your options!" What is and is not the subject of the bargain must be clearly stated. Children his age make even better negotiators than lawyers. I think he's bluffing and trying to wrangle a quick settlement out of her. My guess is she will counter with a screamus extremus. It sounds like the little sponges are starting to squeeze out the things they take in (and hear). I get a chuckle every time my youngster gives a sigh and eye roll just like his momma. When she's upset, instead of growling she'll just say out loud "GROWL! ", so now the youngster does that as well. I don't think I've ever managed to go searching for any old friends and ever found them on the internet. However, having this blog has led one or two people to find me. My junior high and high school friend Ellen stumbled in here a few months ago. My brother's former girlfriend and a friend to me Blair dropped by once a long while ago and then started coming back more often after she got put on bedrest. Other friends drop in now and then too -- one who found her way here back in the very beginning when we actually had an Instalaunch and another who got here after a link to photos my kids reading NR was posted on The Corner. We got a letter from a college pal and his wife this weekend, who happened to stop by and see the birth announcement for our daughter -- congratulating us and letting us know they are expecting their second child. These are reasons I'm rather glad not to be anonymous. Sometimes I wonder if that would be wiser. There are weirdos out there and I've had one or two run-ins with nasty commenters. Mostly though, I really like having a my name on things, so that when someone from my past stumbles in here, I can catch up with them again. It is wonderful to make all the new friends I've made through blogging, but it sure is nice to catch up with old friends too. I'm awfully glad you were Instalanched! Hey, I'm glad I found you too! I love seeing your kids and reading about their adventures! Before I had children, I swore I would never repeat their baby words back to them. I could not believe that my in-laws still would on occasion use the baby word their daughter had had for fork almost twenty years later. It drove me nuts when my sister-in-law and her husband would refer to things by the baby words my niece and nephew used. It is a good thing that I only complained to my husband about these things though, because I've had fewer people to apologize to and fewer people to make fun of me for my change of heart. I love the creative pronunciations and completely different words my children have for things when they first learn to talk. As they grow bigger and speak more clearly, I miss the toddler-speak. My son is very well spoken. He no longer calls bananas "gomanas," backpack isn't rendered as "hatback" any more and he asks for balloons now and not "gaboons." One day after he learned to read, he looked at a tag on some gloves and realized that they weren't called "glubs." He can read and say just about anything. The kid asked for "a reprieve" from the time-out chair the other day. The last vestiges of baby words that he has are calling lasagna "plasagna" and pot pie "hot pie". I'm sure those will disappear soon. My two year old talks all the time now. A lot of what she says like, "I won't!" isn't all that cute, and a lot of her baby words are disappearing too. She still mysteriously refers to music and singing as "why-o" but she's also started asking to "ding dongs in the dongbook." As soon as her pronunciation gets better I bet we'll never hear about "why-o" again. She's already saying "Be-a-rix" and not just "Bee-rix" for her sister's name. In the past, her favorite animal was the "hippomanus," but yesterday she said it "hippodominus" which sounds like the Latin for the über horse, but really she's starting to notice all the syllables and pay more attention to how one really says hippopotamus. As with many other things, I want them to grow up. I wouldn't want to see one of my children go off to a job interview talking or acting like a toddler. However, I miss these words -- symbols of babyhood -- as they get bigger and forget them. I wish I had recorded all the funny ones. I'm holding on to all the words I can remember now -- and chances are in twenty years I may pop out with one of these words that no one else remembers. I know it will make me smile. Sounds like a great name for a rock band. Or a weird pagan cult. Jonathan's newest one was one he came up with last night: "cardigated." As in "cardigated cardboard." LOL about not having to apologize. Before children, I held similar views to yours regarding baby talk. Now, I still call leggings "smooth pants" and Christmas decorations "Decornations". My kids no longer say these things, but I can't seem to let them go. Well, who can resist referring to toothpaste as "pooptaste"? (really! no kidding!) "BapuWapu " will forever be a mystery, however. In my family we still call airplanes "peepahs" and we pick up people from the "peepah port", chewing gum is still "kiki", and these have always been fond memories of when my brother and I were kids, the interesting thing is that it is mainly my mother and I that still use them. I think it is a maternal thing. When I was little we had to travel through Miami (FLA) whenever we came to the US and we always had a discussion with my brother who always complained that "It isn't your Ami, it is my ami". My mother wrote down most of the adorable/wise/strange things that came out of our mouths, I was touched when I found it last year. I plan on trying to do the same. My neice coined quite a few words that my extended family still use. As for my kids, we still use some of their words. I still haven't figured out how the wrinkled skin on her fingers after her bath became "Kool Aid" for the EAC, though. I have a small book I try to enter these jewels in ..
My son was counting foxes: One foc, two focs, etc. And my daughter used to sing the I love New York jingle as "I love you nork!" Sunday was indeed a calmer day. The whole family made it to church for both morning and evening worship -- although we did miss about 15 minutes of Bible class. We'll have to work on the morning routine a bit more. We had a nice calm afternoon between services. No real napping was done, but we did have a nice period where the kids wanted to listen to Tom Petty, The Boy read aloud from a book on bird watching, The Girl brought over one of our poetry collections and demanded "a story," and The Baby just snoozed. Sure it probably sounds bizarre to the rest of you, but it was pleasant. The Baby had one episode of throwing up yesterday, but seems to be turning a corner and doing a lot better. She hasn't thrown up at all today. We had her two week checkup this morning and she's an ounce over her birth weight, so something is staying down. Nope, doesn't sound a bit bizarre. Sounds like "home" for a wonderful group of people. Sounds like a blessed break. The Tom Petty part sounds particularly good to me. Glad you're bringing the children up with some highbrow culture. Can I Get a Do-Over on the Weekend? We still have Sunday to go, but Friday was a bust and Saturday has been exhausting. Friday was grey and cool. In the morning I took the older two kids out to run a few errands, while Justin, who has a cold stayed home to nap with the baby -- only she didn't sleep. So he decided to go into work for a bit after I got back, but first he tried to turn on the heat. Didn't work at the thermostat, so he tried going through the whole procedure of restarting it. He did that about 5 times, before it really sunk in that the thing was not going to start. We called in the guys we buy a yearly service contract on the furnace from and they came out within a few hours. The ignition switch was broken, so the guy went to get the part and then started doing the regular service, inspection and cleaning before installing it -- which is when he found holes in the exchange. Now, it is a 12 year old, bottom-of-the-line furnace, so we knew it was going out soon, but it would have been nice to get another year or two from it. NOT! The bad news is that a furnace is downright pricey. The good news is that they were offering no interest financing and they could install it today. So we have heat. Right after the salesman left taking our meagre fortune and plenty of money we don't yet posess with him, the Baby threw up. Now she spits up on occassion, but recently she's been making a hacking noise followed by yellow puke. This time the puke wasn't just yellow, it was clear -- like broth. That scared me enough to call the pediatrician, who must have worried too, because she sent us to the ER. We quickly found accomodations for the big kids and a neighbor to watch the dog and headed off. Lots of hours, an x-ray and a consultation with the gastro-guys and we got to go home with everyone's best guess being that she either has bad reflux, an irritation somewhere or a stomach virus. Anyway, nothing as serious as they'd feared. Bedtime at 1 a.m. doesn't make for lively parents the next morning, but we were up bright and early to let the furnace guys in. When they finished in a super speed 2 hours, we headed off to get the kids and directly on to a festival at The Boy's school. We were there from noon to four or so and the kids had fun doing crafts and games and all the neat things there were, but that meant no nap for anyone. When we got home a kind neighbor brought us food. I always try to make a meal for people when they have a baby and people have done so for us in the past, but it has been even more wonderful this time than ever before and I must remember to cook more for others when they are sick or out-of-the-loop. It sure does mean a lot and help a lot. I'm praying for a calm and peaceful day tomorrow, with a nice long nap in the middle. That sounds brutally exhausting: physically, emotionally, financially. Thank God for the civilizing rituals of taking meals to people. It keeps us all -- givers and receivers, alike -- sane. I pray for a less epic week for you. Bless your heart, Jordana--sounds like a real challenge of a weekend. I sure hope Sunday was better. You have always been so thoughtful! I can say that the gift of a meal is always a special gift from people. How nice of your neighbor! AWWWWWWWWW!!!! So cute!!! What a proud papa! See Beatrix looking up at him? AWWWWWWWW!!!! Bet he's glad to have all his girls home now and away from the hospital. Hope you're settling in nicely...and my, what a handsome family you have. To all of our service men and women past and present, a great big thanks -- stay safe. Where Were You at 4:45? Most sane people answer this question with, "Sound asleep in bed." And I was too. The baby and I were cuddled together and my husband was snoozing away on the other side of the bed, when screams of "Daddy!" followed by much sobbing broke through my pleasant dreams. The two year old, not the baby, has been the greatest source of midnight wakings lately, whether because she's having bad dreams, getting cold, or just wanting to stick it to her tired parents, we aren't sure. Whatever the reason, she was up again and this time there were a few extra twists. My husband ran up the stairs and I almost fell asleep again, when I heard him running water in the bathroom. That meant either someone had thrown up or someone had wet the bed and needed to be cleaned up. Neither is pleasant at 4:45, but I was just routing for no vomit when I carried clean sheets upstairs under one arm and the now wide awake baby with the other. Hooray! It's only urine. My son, who has finally graduated from Pull-ups, still has an accident every once in a while and this was one of those nights. Of course, this was also the night we realized that thanks to a few puddle pads not surviving the dryer, we had no spares. We finally threw on two crib sized ones, even though we just knew that since he'd wet the bed once, we'd be fine to make it up without a pad just this once. Or not. When he got up in the morning, his bed was soaked again. So loads and loads of laundry await. It wasn't like I didn't already have a totally full hamper filled with things covered in baby spit-up, but then I think they are really all conspiring against me. You'd better believe I'm already teaching The Boy how to do laundry on his own. Ouch! May be time to call in the cavalry, but having your parents (or in-laws) around could be a mixed blessing. While it may be tempting to go back to the pull-ups, try not to backslide. They get expensive, and you don't want the boy to regress to bad habits that will be more difficult to break down the road. 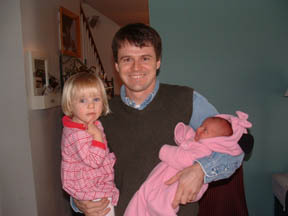 That's a great picture of Dad and his 2 girls. I'm a little jealous of him, but still happy for him (and you) being surrounded by all that little girl love. Ah yes. Little boys, no pull-ups, middle of the night distress calls. I remember those days. The parenting classes for adopting special needs children suggested handling it matter-of-factly, no judgement, but make the child get up, take a bath and change his own bed. I remembered that when a few accidents happened (moving into an adoptive home when you're in kindergarden is stressful as is having a new baby sister and starting school). It took one boy only once and no more accidents. The other boy needed to do it twice. Four out of my five children have had limited success in staying dry at night, until they were about 7 years old. It cures itself eventually; generally it is a matter of the development of the bladder. The littlest one in my house now has had the most difficulties; and she is really trying. But she just sleeps so deep soemtimes! Going to bed earlier helps her; she isn't in deep sleep when nature calls, at least that is what we figured out. But getting my Monkey into bed early is like getting an elephant into a closet. It can be done, but it is hard. I went through my maternity clothes yesterday and packed up most of mine and returning the borrowed things. It is some what exciting to pull out all my old favorite t-shirts and jeans, a few of which I can already wear and most of which will fit fairly soon. I even wore my regular overalls yesterday, until a tidal wave of baby spit-up washed over the front of them. Packing the clothes up is also a sad thing though. The vain part of me will miss them, because my maternity clothes are always more fashionable and stylish than the things I generally wear. Really though, I generally hate admitting that my pregnancy is really over. As much as I wanted it to be over and as much as I adore watching the teeny little thing that used to be inside, I miss the comforting feeling of little wriggles and kicks. I miss the quiet and the sleep too, of course. Plus, this was my third and possibly last baby. I might just be packing these clothes up until some later date when I just give them all away never to be worn by me again. I'm certainly not ready to commit to a fourth child and I spent a lot of my pregancy thinking there was no way I could ever do this again, but I'll miss all those clothes if I never wear them again. I'll miss the wriggles and kicks. I'll look at the kidlets I have and wonder, "What if..."
Therefore, right now the clothes will lie dormant under my bed. In a few years I will pull them out and ship them off to Goodwill or wear them one more time. If the latter, I'll know it will be my last chance to wear them and in the end they'll be headed for Goodwill anyway. But for now, good-bye to them. I need to go figure out which regular pants will fit. That wistful feeling takes a while to ebb, I think. I know even after four, and with the youngest now being seven, and with birthday 45 coming in only two months, Reba still gets those pangs. I think if we could have afforded it, she would have been happy following in her grandmothers' (both of them) footsteps and had twice as many. Of course, then I'd be twice as insane. Poignant. I loved being pregnant and, really, the only disappointment of our blessed lives is that we experienced it only once. Justin has been home on paternity leave, but tomorrow he's headed back to work for at least part of the day. And it isn't one of The Boy's school days, so I'll have all three kids at home. Yikes. I'm definitely a bit nervous and won't be all the surprised if I find myself bound and gagged with the kids doing war whoops around me. Just make sure that they whoop quietly, so that you and Bea can take a nap. Hmmm, maybe inside an indoor teepee? Actually there really isn't much happening. There is a lot of baby watching on my part and she's doing the three things babies do best -- eating, sleeping and excreting. Otherwise, the older two are being pretty good and generally tolerating the new addition well. The Boy takes it all in stride and has gotten out his sling and a baby doll -- his dad probably fears that I'm turning him into Alan Alda, but I'm not too worried. The Boy was a little worried that he couldn't breastfeed his baby because he didn't "have a wife," but he decided he could use a sportsbottle instead -- being the militant breastfeeder, I don't actually have any bottles around. The Bigger Girl is being sweet as well and loves to "hold" her sister and sniff her hair and then declare, "Mmmm. 'Mell good." Being surplanted as the baby in the family isn't entirely easy though and she is more prone to nasty tantrums than before. She hasn't taken anything out on the tiny one though. It is amazing to me how my teeny-tiny two year old could have gotten so huge overnight. I saw it last time with The Boy, but it seems even more striking this time. It sure was nice to have a baby daughter and see the candidate I wanted win all in just a two day span. It has been a good week. lol! Love the sports bottle thing! I'm an avid breast-feeding advocate, too. God knew what He was doing. I'm thankful that bottles exist for those women who can't breastfeed, and for daddies to have the occasional delight of getting to feed their little ones. My husband and I have a deal that I fill them up and he cleans them up. :) He's really never cared about feeding them, but I know a lot of dads really take pleasure in doing so and there are a lot of other reasons to bottle-feed. Both of my older ones probably got one bottle each, when we went out somewhere, but we're boring enough that that's about all we went out during their babyhoods without them. Hey, good deal! Mine never liked bottles or pacies. They wanted Momma only, which made it difficult to leave the house without them. We did get out now and then, but it was only for 2 hours at a time. I just love breastfeeding. A blessing in so many ways. This is starting to sound like my house. Neither child would take a bottle (even filled with breast milk), so I got out of the feeding part. It's not like I got to sleep in anyway, but I got the output without the input too. Oh she is a sweetie, and I'm sorry I didn't stop in before to say Mazel Tov; I didn't get a heads up. What a beautiful little miracle. It is odd how big the older one's seem. 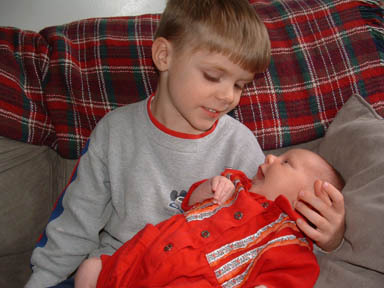 I remember that with my kids; expecially between the oldest and her brother. Mazel Tov! and may she live till 120 years, all in good health of body, mind, heart and soul. Babies in the house tend to be so entertaining and time consuming that you just don't get out much, besides shopping for food and other essentials. The best part about feeding a baby, after a successful burping (just air with a minimum amount of liquid or none at all coming up) is when the baby falls asleep on your chest and you don't have to go anywhere for awhile. I miss the sound, smell and warmth of those times, but I thank God for the time I was blessed to experience that. And don't you love feeling thinner?!??! Since my press agent has already spread the news and even gotten all the details including the spelling of Beatrix's name correct, I guess that all I have left to do is post a photo and tell you that we're all doing well and even sleeping once in a while. That's a great way to get out of having to follow the election. What a beautiful photo....and the name is perfect. Rest well, sweet thing. Both of you make quite a beautiful sight. Congratulations and all our best to you and the rest of the crew. Glad to hear all is well. So now do you have the Boy, the Girl and the Baby? May your home be filled with joy, contentment and peace (not the absence of noise kind, but the other, more satisfying kind). A beautiful name for a beautiful girl. I'm very happy for you and your family! Blessings to you you and Beatrix. 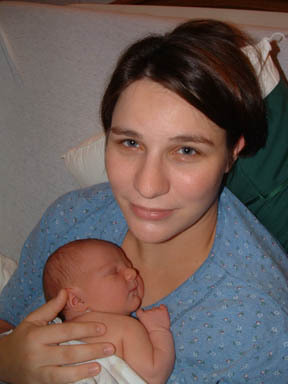 I have never seen a better newborn photo of infant and mother! Congratulations—I’m assuming everything is fine and both of you have the correct number of fingers and toes, etc. I'll add my congratulations and wishes for continued happiness with your precious baby Beatrix. What a blessing! Congratulations. What an awesome picture!!! Ahhhhh! What a sweet little baby! You both look great! Congratulations! And thanks for helping me win the pool! Yippee! Truly a precious photo. Congrats! How wonderful for Justin and yourself! She is a beautiful (or as some Philly folks would say ... bew-tee-full) baby. Beatrix is from Beatrix Potter, I would guess. What a lovely way to keep the Anglophile naming trend in your family. Just think ... no more "tummy ball." 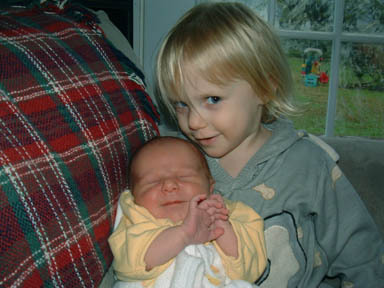 And you have the best revenge: The Girl now has a little sister to compete with. Actually, The Girl will thank you when she grows up for each new sibling you added to her life. Love trumps the petty problems that occur in everyday family life. It's just that it won't seem that way some days, especially when they are at each other's throats. God bless all the Adams family at this joyous occasion. Beautiful! You do good work girl. Congratulations! What a beautiful addition to your family, Jordana. I was hoping you had put a picture up! I am so happy for you and the family. Y'all are just so beautiful. You look so peaceful, and she's simply a doll. . .